When I started out on this writing journey, I never saw myself as someone who could a whole bunch of writing projects going at the same time. 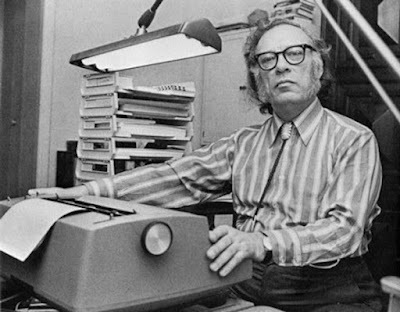 That kind of thing was reserved for some of the great prolific authors like Isaac Asimov, who was notorious for working on multiple projects on a regular basis. The man insisted on having a portable typewriter or two wherever he went. And if he couldn't get his hands on a typewriter, he'd pull out a pad of paper and a bunch of pencils/pens and wrote the old fashion way, long hand. First I'd like to thank everyone who took advantage of my "Hobbit Birthday" party. Over 30 copies of "The Vampyre Blogs - Coming Home" were snatched up. While I would've loved to have seen triple digits, I'm not going to complain. The book got into more readers hands and that is always a good thing in my opinion. Hopefully, this will lead to some more reviews. Sadly, Nathan and company have been stuck in the single digits as far as reviews go on Amazon, with absolutely none on Barnes and Noble, Kobo, and Smashwords. So I'm going to offer everyone who is interested the opportunity to get a free copy of the book (Kindle, Nook, Kobo, PDF, even paperback) in exchange for a fair and honest review. Reviews are important to bringing a book to a wider audience. We all know that whenever we think about purchasing a book or almost anything these days, we check online to see what kind of rating the item has.